created for johnnie walker house's willow collection limited edition bottle (singapore). johnnie walker is a brand of scotch whiskey that originated in the scottish town of kilmarnok, east ayrshire. the brand was first established by grocer john walker. 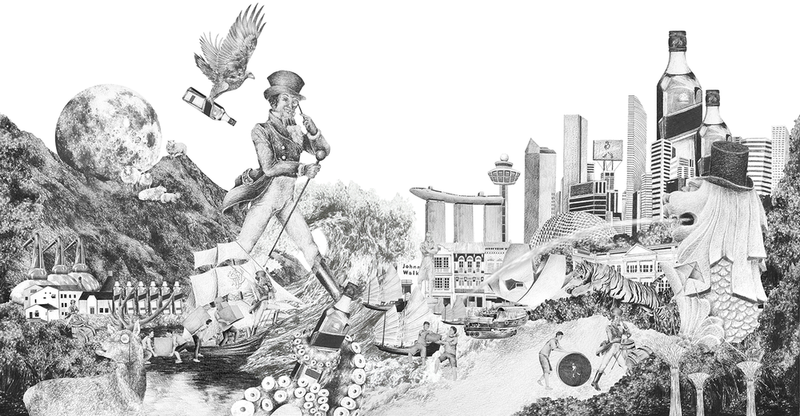 It is the most widely distributed brand of blended scotch whisky in the world, with annual sales of over 223.7 million 700 ml bottles in 2016.
to celebrate the pioneering spirit that johnnie walker represents, create a visual story depicting the journey walker took from scotland to singapore in 1885. the striding man icon should be prominent in the artwork. he is to lead the charge. cultural storytelling elements that are relevant to brand and location are to be included, ensuring there is a balance of contemporary and historic content.